Local parents who have children at St Bede's will know that last year the school introduced a park and stride scheme to get more families to do at least some part of their journey to school on foot. This is commendable as the area where the school is located is not particularly easy to go to by car and there are health benefits associated with a) walking and b) having fewer cars (read air pollutants) in the vicinity of the school. 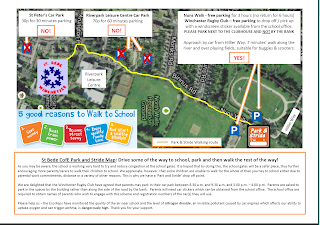 The Park and Stride Scheme as it was introduced in 2014 sent people to the parking area near Riverside Nursery school, so that they can walk from there along the recreation ground to school. Of course the scheme has an effect on people living in Abbotts Barton as there are many people who navigate Hillier Way on foot or bicycle for the school run, or to get to the nursery. We had a small discussion in our Facebook Forum about this last year but not knowing what the impact would be I decided to wait and see. This year, after talking to the other committee members and a number of local people who use this route daily, and looking at the responses to our still ongoing community plan survey (36 out of 53 respondents agree or strongly agree with the need of pedestrian safety on the lower half of Hillier Way), I decided to write an email on behalf of the group to the school to request a small but important change to the scheme. Many people feel especially unsafe on the lower part of Hillier Road where there is no proper footpath, especially around the corner at Riverside Nursery School. This could easily be avoided by using the car park near Nun's Walk. So we asked the school to point out the car park near Nun's Walk as a preferred option as it would reduce the traffic at the pinpoint near the nursery school and it doesn't really make the walk to school much longer. The email was sent just before half-term and we haven't received an answer yet. This morning (11 Nov) I quickly talked to the Headteacher Mrs Duck to see where our request had got to and was told that it had been received and the responsible group is apparently in discussion with the Winchester City Council travel planning group - and we should have had some sort of reply and if only to acknowledge that they are looking into it. 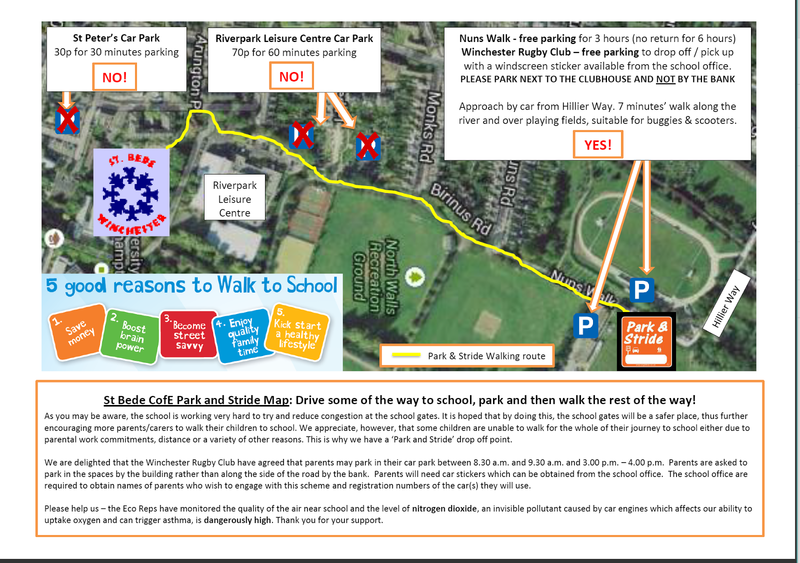 I would like to write to you about the Park and Stride scheme the school are promoting. As a parent at St Bede I welcome any steps to get rid of congestions at the school gate and also of course of a reduction of pollutants in the air around the school and I believe the scheme is a vital step towards that direction. However, as a resident of Abbotts Barton and a member of the Abbotts Barton Community Group, I and others are slightly unhappy with the promoted car parks, as the scheme is recommending only areas at Riverside Nursery and the Rugby Club. I was already having these same thoughts last year when you first introduced the scheme and I and some other members of the group talked to Dominic Hiscock who was governor of the school at that point and who is our local ward councillor to see what his thoughts were. I decided to wait and see how many people were really taking it up. As a cyclist myself I go down that route quite late during the school run so I am not fully aware of how many more cars are stopping there (apart from noticing that the parking bays at Riverside Nursery school seem to be all filled up at that time these days), but from your step of including the Rugby Club car park I take it that the scheme is quite popular and more space was needed. The main problem for us is that the bigger public car park just behind the river at the left before the Air Cadet hut is not mentioned at all and we think this should be the preferred option: this car park also allows free parking for 3 hours (no return for 6 hours), has 28 parking bays open to all, and is only a couple of minutes further up the road from the area you recommend. Furthermore this car park has the advantage that it gives easy access to the Nun’s Walk path that takes you along the river. The path was repaired in June 2014 and will allow people to have a pleasant traffic free walk with a view of the allotments. At the end of the path you have the choice to either turn left into Nun’s Road which will take you back to your advised route along the recreation ground, or to continue on to walk to school past Hyde Abbey. These variations take about the same time as the route along the rugby club and as a bonus there are pavements throughout. The Community Group would like to ask you to add this car park to your list as preferred option, as at school run time the route to the promoted parking areas is heavily used by walking and cycling families who live in Abbotts Barton, with some of them having no choice of another route as they need to get to Riverside Nursery. The overall situation is not helped by not having a proper pavement starting exactly at that car park: pedestrians, cyclists and cars have to share the limited space. By recommending to the participants of the scheme to drive down that far, we fear that there is an increased danger of accidents, especially around the corner at the Riverside Nursery school. Unfortunately not everybody is keeping to the speed limit of 10mph, so the less traffic gets down there the safer it would be. Asking people to not drive any further down, unless absolutely necessary, would also help keeping the air pollutants (that you so rightly don’t want near the school) away from the pedestrians and cyclists along that route. It needs to be said that the Abbotts Barton community was very relieved in 2013 when commuter parking along Hillier Way and at the Rugby Club was stopped by introducing a traffic regulation order that limited parking along that route. Seeing more and more vehicles going down there again is a concern to many residents. As it happens, the Community Group is currently running a survey about their draft community plan, and from the results so far, concerns about traffic and pedestrian safety are scoring high with the community: one of the areas mentioned in particular is Hillier Road! Of course, we would be very happy to show you the car park and the route along Nun’s Walk path, and hope you will take our request to add the bigger car park as preferred option to your scheme under consideration.